As you may have noticed, I’m not the kind of person who just throws together things in the kitchen without a map, compass, 637 glowing reviews on Epicurious or a friend’s sworn assurance, sometimes written, that a specific recipe is a guaranteed to blow the ennui right out of your taste buds. Sure, I’ll make small adjustments while I work on something to accommodate our personal preferences, but aside from pasta sauces, eggs and salad dressings, I rarely go it on my own intuition. You see, my intuition has led me to all sort of unsavory places, in and out of the kitchen, though I’ll save the latter for another time, or say, encyclopedia volume. As for cooking, one time, my homemade oatmeal made me so violently ill, I had to cancel a date. (Though perhaps, that was some conniving intuition, after all, as it was not with Alex. Cue: swoon or nausea.) The milk, as it turned out, was not past is expiration date but most-definitely rancid. (The sniff test on all dairy products, from those from a friend’s fridge to restaurants with $40-entrees, has since been instituted, offended sensibilities be damned.) Another time, I tried to bread and pan-fry tofu – because how hard could that be – and created a dish that was so foul, just the memory of it has killed my hunger pains for lunch. So, as you see, these days I use recipes to anchor my cooking urges to a safe harbor. 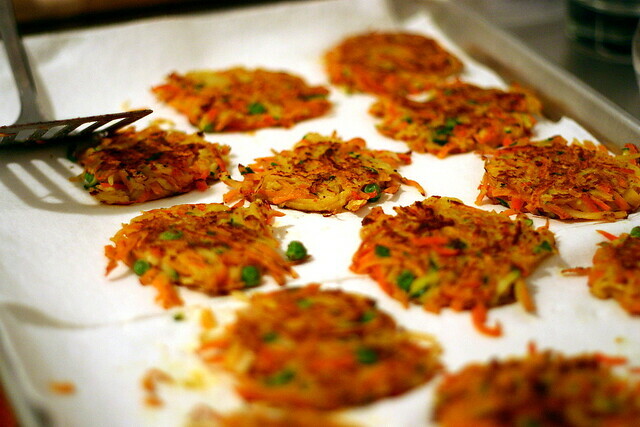 Last year, I came across a recipe for Indian potato pancakes on Epicurious. The reviews were far from glowing; the recipe has its share of flaws but the idea of an Indian-spiced fritter rooted so firmly in my taste bud’s anticipations, I knew I had to find a way to make it right or I’d never get it out of my mind. I exchanged potatoes for a mix of vegetables, doubled some and tripled other spices, added enough egg that the patties would hold together, reduced their oiliness and sweetened up the too-tangy yogurt, landing on a creation that Alex and I fell upon like a pack of wild dogs that had been denied whatever it is that makes them wild for months beforehand. The next day, I brought some into work, where even the most unadventurous coworkers fell prey to the fritters’ charm. And, unexpectedly, I followed that whole “gut” thing far enough that I ended up with something almost as far from the original as one can get, and accidentally landed on one of the first recipes I can call even halfway my own. I hope you like it as much as we do. Preheat oven to 200°F. Place two nonstick baking sheets in oven. In small saucepan, bring salted water to boil. Add peas and cook, uncovered, until heated through, about 2 to 3 minutes. Drain, then rinse in colander under cool, running water. Set aside in colander to drain completely. Using box grater or food processor² fitted with grating disc, coarsely grate onion, potatoes, carrot and zucchini and place in colander set in sink, setting aside to drain. In large mixing bowl, lightly beat eggs. Whisk in flour, coriander, turmeric, and cumin. Mix in ginger, cilantro, and peas. Press potatoes and onion to extract as much liquid as possible, then add to bowl. Season mixture with salt and freshly ground black pepper. Using wooden spoon or hands, mix well, but do not overwork. In heavy-bottomed, 12-inch non-stick³ skillet over moderately high heat, heat 1-2 tablespoons oil (I used an extra-virgin olive oil spray I’d found to lightly coat the pan); until hot but not smoking. Drop 4 scant 1/4-cup portions of potato mixture into pan and flatten with spatula to form four 3-inch pancakes. Fry until bottoms are golden-brown (the color really counts on this; the darker you let it go, the more the pancake holds together – this goes for both sides. ), 4 to 5 minutes, then turn over and fry until golden-brown and crisp, an additional 4 to 5 minutes. Transfer to paper towels to drain; season immediately with salt and pepper. Keep warm on baking sheets in oven while making remaining pancakes. Using paper towels, carefully wipe out pan. And 1 tablespoon oil to the pan and fry 4 more pancakes. Repeat with remaining batter, wiping out pan and adding 1 to 2 tablespoons oil before each batch. Serve pancakes hot with Curry-Lime Yogurt. ¹Or, you could do this step in the microwave, and save yourself a good bit of effort. ²Yet another recipe that yes, if you have a food processor, it takes no time at all to put this together. That said, it makes for more coarsely-grated vegetables than doing it by hand, so they are slightly harder to assemble into pancakes. ³I know there is a lot of head-shaking at nonstick these days, and I, too, try to avoid it when possible. Still, pancakes like this are much, much more difficult to make without non-stick, as you’ll end up using tablespoon after tablespoon of oil to keep the fritters from sticking. Those sound wonderful! I’ve been wanting to try some Indian recipes, but my husband seems to be opposed to the idea. Maybe something like this would help ease him into eating Indian food. I found your site after Julia at Here Be Hippographs mentioned it. I had my husband check it out too as part of my arguement that we really need a new camera if we are going to take any photos that will get anywhere close to the beauty of yours. I’m very much enjoying the recipes and food discusions. The only semi-original recipe we have come up with recently is adding soy based formula to breastmilk. That way the infant gets twice the calories no matter how little he wants to eat. I refuse to be outwitted by a two month old. And its nice to know that there are others out there that love to sing along with the radio at full voice, whether one knows the words or not and regardless of ability to carry a tune. Good luck with the daily blogging goal. The writing does not disappear into the bottomless internet, There is a sleep deprived and hungry mom in Chicago whp appreciates your efforts! These sound so fabulous I think I know what I’m making this weekend! You can use this new pealer that juilenes (spelling) the vegetable instead of the box grater. It’s much quicker and takes a lot less effort. You may have to double the amount of zuchinni you buy because it doesn’t do well when getting to the seeds. I got mine from Viking but OXO makes a great one and it only costs about $6. That sounds really delicious, but a bit too much work for me. I think I’ll wait until you invite me over for dinner ;) Hehe kidding! Wow, they must taste fantastic! Gorgeous pictures, as well. Oh yowsa. Those look fantastic. I just posted about potato pancakes, much more plain than yours yet pleasing. Still, I think I might have to attempt these soon! Wow! Am I glad that I found your blog! Somehow, one blog has led to another, and I have been compiling my favorite recipes to try. Tomorrow is the market run, and I am really looking forward to it. Your Indian Spiced Vegetables Fritter is making my mouth water as I contemplate the ingredients for my shopping list!!! Those look niiiice! Great pics too! Hurrah! I love it when experimentation actually works out, it makes me think I’m more proficient in the kitcehn than I am, and I like that. Wow. If I get my act together and have a Chanukah party, I may make these for latkes. Guess what I made hot sour soup with what I had in the fridge yesterday, using thai marinade and molasses, and, while I didn’t have any cornstarch and it was brothy, it was really pretty tasty. So, fear not! Its like, chemistry. Worst that could happen is you have to chuck it out. As much as like cooking, doing it by the seat of your pants is inevitable. Bueno, Bueno! Just wanted to let you know I finally tried this recipe last night. I am not a cook by any stretch of the dough (but I’m learning), so the fact that I didn’t screw it up was no small success in itself. The fritters were amazing and the yogurt on top was the perfect compliment. I don’t eat a lot of Indian food, so I thought I would be overwhelmed with spices, but the blend was just right. Thank you for sharing the recipe. Hope the arm is feeling better! I have been searching for potato pancake recipes lately. Now this one sounds REALLY good, even my husband thinks so! Gotta try them some time. 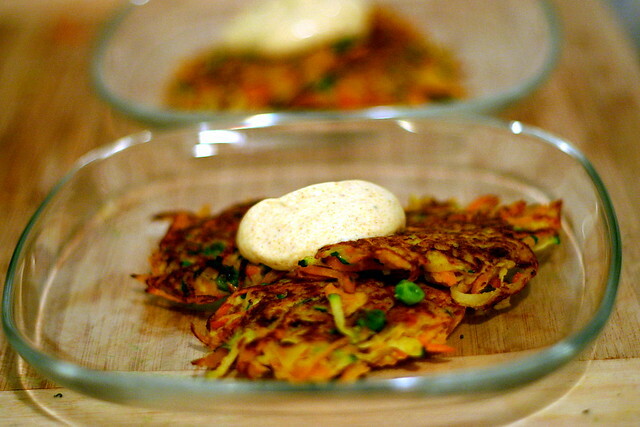 Here’s a recipe for Parsnip & Carrot Pancakes you might like. Any way instead of eggs I can use egg-replacements? I am a vegan and these look delish, would love to figure out a way to make them. I made these vegetable fritters about 2 weeks ago and my husband and I are *hooked*. Made them again this past weekend. They are incredibly delicious and we luuuuuurve them (that’s even beyond love, doncha know :-). We feel virtuous for eating veggies, too! Thanks for this recipe – it is going into regular rotation at our house! I’m a little late here, but was wondering if I could do any of this ahead of time? I’m planning a cocktail party and these look like they would be yummy and finger food. Thoughts? For a cooking competition, I made a fritter based on this idea, but with rice instead of potatoes. We served it with the curry-lime yogurt, mango-coconut chutney and chili-garlic paste. People told us it was their favorite dish (though we didn’t win overall). Anyway, thank you for the inspiration! thanks for the fantastic recipe! Can’t wait to try these! I’ll report back! Hey Deb- I’d been struggling over the same dilemma as you with the non-stick issue. I just discovered the Danish Scanpan line that is a PFOA-free and yet aren’t hurt by metal utensils. They even allow food to brown. They’re a bit pricey but WOW, it may cause us to brag that we use non-stick cookware instead of ducking our heads and half whispering it when describing a recipe step. Check it out! These were absolutely delicious and perfectly seasoned. I squeezed as much liquid out of them as possible and it really helps them brown. I used a lot of paper towels to dry the mixture before adding the egg. I left out the zucchini because I don’t like it and I only used two eggs. I think the third egg makes it too wet. For the dressing, I used greek yogurt and it was perfect. I kept the peas in the recipe because I think they need some green, but they kept rolling out of the fritters-unruly things, peas. I’m a huge, huge fan of your blog and I have successfully created otherwise daunting culinary wonders as a result of your inspiration! Unfortuately, this Blizzard of 2010 will surely have us snowed in at least four more days, and I just had to tell you that these Indian fritters are making my mouth water. I cook Indian food several times a month, but I am certain the moment we get out to the grocery store, I’m taking this ingredient list with me (to accompany your chana masala)! Made the fritters last night for the first time, with your Chana Masala. OMG were they fabulous. Chana Masala was yummy too, but I could of eaten a whole plate of the fritters – if I could have gotten them away from my friend! I tried these, and there was almost no egg holding them together. I think it might have been too high a vegetable to egg ratio. I had a large sweet potato and zucchinis vary so much in size. Can you provide a estimate (weight) for how much veg there should be? I loved the idea and the flavours and would love to have this work better. Oh my. These were just heaven. Thanks so much for the lovely recipe. My family and I just enjoyed them with a korma……….YUM. I tried your Spicy Vegetable Fritters with Peanut Butter Yogurt as an alternate topping (I did try the lime too) they were quite nice. These are so yummy! I made two-bite sized fritters (forgot the peas! ), froze them, then recrisped at 400 degrees (convection) for about 7 minutes for a party. Worked perfectly! love how crisp and beautiful they look! i love sweet potato. Have you ever tried chickpea flour its traditionally used for indian fritters and would taste great in here. Oh my god–these look amazing. Definitely on the menu this week!! I just made these, and even without the curry-lime yogurt (I forgot to get plain yogurt at the store, doh!) topping they were magnificent. I only wish I had found your site and this recipe back when you first posted it. I could have been eating them for the last 3 years, but I haven’t been? Tragic! Thanks for yet another wonderful recipe, Deb! I made these last night for the family, they turned out wonderful and will make them again. Even my picking 2 1/2 year old son at them, he really enjoyed the curry lime yogurt. Thanks for the great recipe! I really enjoy making things from you page and look forward to your cookbook! I made these fantastic things twice, and second time around I ditched boiling the peas; I just mixed them in all frozen. Worked as a charm, and saved me some work. I also found that grating the carrots and potato (but not the sweet potato) finely made the fritters stick together more easily. Just made these for a vegeterian brunch! The curry-lime yogurt went over very well. My guests even put it on their bread :o) I almost thought the mixture would be too watery, but it just made for a moist fritter. Delicious and different! Thanks!! I made these using an all-purpose gluten-free flour and they were excellent! My husband loved them too!! I made these last night for an Indian-themed dinner party and they were a hit (especially with my group of vegetarian friends). I think I’m going to go Asian later this week–just sweet potatoes and carrots and season the egg batter with ginger, wasabi, and a little sugar. Thanks for the recipe! I made these only using potatoes and peas, and it was still delicious! I also added a tsp of cumin and a dash of cinnamon to the curry-lime yogurt to taste more exotic. It was a hit with my family. Great recipe, thank you! If you’re looking to try that battered tofu again, which can turn out brilliantly, I suggest lightly dipping it in a mixture of salt and cornflour, and then frying in olive oil until golden on the outside! Then, whip up a chili/soy sauce/ honey dipping sauce, and voila! The crispness of the outer tofu crust compliments perfectly the spicy sweet sauce, and the softness of the tofu, give it a try! I’m a young london teenager who loves cooking and I love your blog as well! Keep up the good work please! I made these to go with the rajmah I made from this site. I’ve been on a vegetable pancake kick lately and it occurred to me as I was making them that they are essentially what I normally do with veggie pancakes, except with a *lot* less flour. Funny how foods start to seem like variations on a theme after a while. I made my gluten-free, by the way, with brown rice flour, and it worked just fine. I didn’t make the sauce, my wife not being a big fan of yogurt. We had them with caramelized onion chutney. That stuff is the bomb, by the way; I slather it on just about everything when I have it around. Hi Deb – I am a little bit confused. Do you use the oil in addition to the spray? Or just the spray? In which case, do you respray between batches? Or spray for the first batch, and then oil before each consecutive one? Thank you! I made these last night. My husband really liked them. So did I but I was not wild about the curry yogurt sauce- the taste of raw spices. Next time I would sauté a little onion in a neutral oil, add the spices, cook for a minute then add the yogurt, lime and sugar and let cool to room temp. This is a wonderful recipe, thank you. I made it for dinner today–the spices were fabulous, my husband and son ate them all up! I have a tip: I separated the eggs, beat the whites, and folded them in last, just before frying them, (I added the egg yolks to the grated vegetables with the spices and flour). This makes the fritters stick together when frying, and makes them nice and light–just delicious. I also added a small amount of canned corn just for fun. Otherwise, a super and original recipe–perfect! Hi, I just made these for dinner and wow, they are delicious! Perfect and just like the picture. I didn’t make the yogurt, nor did I add THE peas…but dang girl, YUM! Thanks for a brand new fav.! Someone I didn’t know brought these to an event I attended a few days ago and I couldn’t stop eating them. Asked the cook for her contact info so I could get the recipe, followed up with her immediately, and she directed me to this site. THANK YOU! These are heavenly. I did it because that’s what I had. and I thought nothing of it. This was last Friday. Took me a few days to regain my strength. Tonight I ‘ll go easy; Zucchini fritters with white flour. I’m praying …. My vegetarian teenaged daughter inhaled these last night. Delicious. She said they were as good as pakora. We served them with a yoghurt/garlic dip. Thanks so much. Possibly already asked… but can you freeze these? I make a similar recipe but it includes coarsely chopped cauliflower rather than zuccini and sweet potato — and I use gram flour (chickpea/garbanzo flour) instead of regular wheat flour. I am going to try your dipping sauce next time!! sounds delicious. I made these the first time today and as someone who loves Indian food, I found the spice amount pretty underwhelming. Otherwise it’s a great recipe.